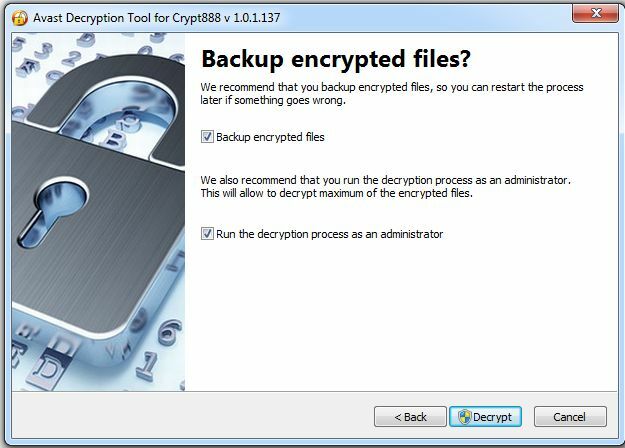 Avast Decryption Tool for Crypt888 can decrypt files that have been encrypted with the Crypt888 ransomware (aka Mircop). Crypt888 has been observed in the wild since June 2006. Once it encrypts your files it adds "Lock." to the beginning of the file and changes your Desktop wallpaper to demand a ransom. This tool, provided for free by Avast!, can be used to decrypt files without paying a ransom.